As part of an ongoing coverage of China's IPY Polar research projects and activities, SciencePoles interviewed Professor Yang Huigen, the new Director of the Polar Research Institute of China (PRIC) responsible for carrying our scientific research in the Polar Regions, operating Chinese research stations and vessels, and promoting cooperation with international Polar research organisations. Professor Yang, why is it important for China to be involved and increasingly active in the field of Polar research? This is a very important question. From the science point of view, of course, the Chinese polar community realises that it is very important to achieve a better understanding of global change. So that is the first thing. But in addition, I would say that Chinese politicians have now also realized that the Polar Regions are very important in this change and have put national measures in place to react to it. That is why they are increasingly attentive as to the quality of our research. They really want to know what is happening in the Polar Regions. Furthermore, the Chinese public is now also increasingly interested in this kind of remote and extreme environment, as well as more and more curious about our research and what is going on outside China. And finally the economic situation in the China is good at the moment, which of course helps in regards to funding. So I would say that currently, we are benefiting from a good conjuncture for our work. 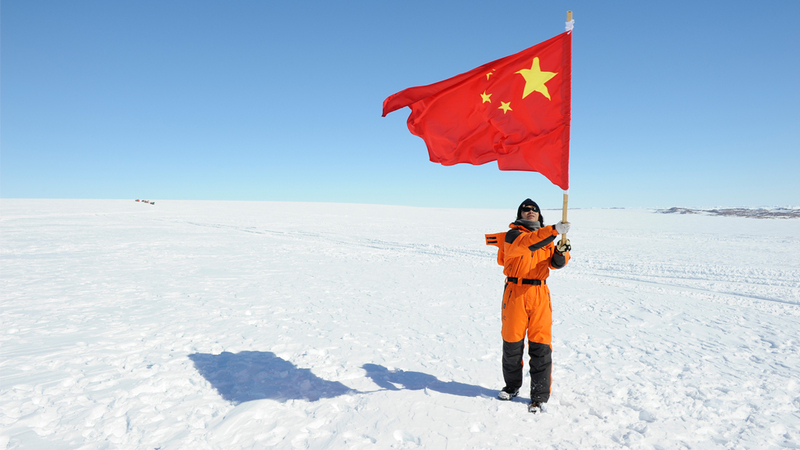 Within the context of IPY, China is currently in the process of upgrading its Polar research platforms in both the Antarctic and the Arctic. Can you tell us more about this, starting with your icebreaker Xue Long? We purchased Xue Long from the Ukraine in 1993. It was originally designed for cargo transportation in the Arctic, so had to be readapted for our use at that time. In the last few years, however, we found that the control and communication systems were getting old and a little unsafe, and that it was no longer possible to find replacement components, so we decided to upgrade them completely. Now it is equipped with one of the best and most modern automation systems for any icebreaker. In addition, we have also upgraded living areas and improved its research capacity, by enlarging the laboratory space and installing higher performing winches and other equipment necessary for research. It is now really fit for its purpose and we expect it to serve us for another fifteen years or so. What about Great Wall Station on King George Station (Antarctic Peninsula)? Great Wall Station was first established in 1984, but as a result of aging and the high salinity levels of its local environment, the original buildings have significantly deteriorated over time and need to be replaced. We are taking this opportunity to enlarge the station to an internal surface area of 2,500 square meters, which will include accommodation, living, and laboratory space. The laboratory will be dedicated to the study of the sub-Antarctic marine and biological ecology, and we will of course continue our meteorological, geodetic and ionosphere observations. Zhongshan station in East Antarctica? Zhongshan station is our biggest Antarctic station, and is the place where we focus most of our scientific efforts. Atmospheric physics is one of the principle disciplines at Zhongshan because the station is very well placed for studying the magnetosphere. In fact, we have an active upper atmosphere physics collaboration with Japan and other nations that have stations in appropriate locations for this type of research. This means that we now have a very effective observation system for studying auroras and the ionosphere. The second research emphasis at Zhongshan station is glaciology. Close to the station we have the Amery ice shelf and Lambert glacier, and it is also the base for our inland expeditions to the Dome A region and the Grove Mountains where our researchers have been monitoring ice sheet fluctuations and changes in glacial flow. Also in the Grove Mountains, Chinese scientists continue to collect meteorites and to carry out geological studies. The third emphasis at Zhongshan is on our continued oceanographic and biological investigation of the Pritz Bay region which started in 1989, and for which we also use our icebreaker Xue Long. As with Great Wall Station, we are currently also carrying out a lot of construction work at Zhongshan station and are increasing the interior floor space to almost 4,000 square meters. We will extend the living and accommodation space, and also build two new scientific buildings: One for atmospheric physic observations and another which will include two laboratories. One laboratory for environment monitoring, and the other for glaciology which will also comprise a large refrigerator to store the ice cores we plan to retrieve from Dome A. In the Arctic we have established permanent research station at Ny Ålesund in Svalbard called Yellow River. There, we again carry out some atmospheric and aurora observations, and have both a marine laboratory and a dry laboratory for field investigations. As part of our IPY PANDA research programme, we are also planning international research cruises in the Arctic aboard Xue Long in the coming years. Back in the Antarctic, you are also planning a new station at Dome A, the culminating point of the Antarctic ice sheet. Could you tell us how this project came about, and also about plans for the future? We have been looking at the possibility of establishing an inland station for a long time now. As far back as 1990 when our scientists involved in the international IPIC ice core drilling project wanted to go to Dome A to retrieve an ice core. Our plan now is to establish a summer station by the end of the IPY. The station will accommodate about fifteen people and in the coming years we plan to drill a first ice core to about 500 meters. This will be in the context of our climate change investigation, and in collaboration with France and Japan. Eventually, we want to drill to the bottom of the ice sheet, or about 3000 metres, to recover a climate record in excess of a million years, but this could take another ten years or so to achieve. As a first step, this season's Chinare expedition has made further investigations about the topography beneath the ice sheet at Dome A, in order to help pin-point the optimum site for drilling. We also plan to carry out astronomical investigations at Dome A and believe that, because of the dryness of its air and thinness of its atmosphere, it could be the best site on Earth for ground-based astronomy. This is very exciting, and this year, in a collaboration between the National Astronomical Observatories of China, Texas A&M and the University of New South Whales in Australia, we have deployed our first fully automated site testing observatory and a small telescope which will remain there and function in autonomy until our next Chinare expedition at the end of 2008. Known as PLATO, the observatory will send back data through the Iridium satellite system and provide us with precious information about the parameters and environmental conditions of the site. This will then help determine the future development and deployment of the project. And finally, we will use our Dome A facility to carry out atmospheric and upper atmospheric observations (preliminary tests are being carried out with the UK's British Antarctic Survey), as well as to study the geology, sub glacial lakes, and Gamburtsev Mountain range that lie beneath the ice sheet. So you can see that the station will be useful for a whole range of scientific disciplines. And which of these disciplines will determine the precise location of the future station in the Dome A region? Do you think Dome A become an all-year station at some stage in the future? Yes, but the logistical and technical challenges are very great because of the conditions at Dome A, and ultimately, I think it will depend on the needs of astronomy projects and the kind of science that will be developed. Dome A is exceptionally high and cold, so we will need to build up experience. If everything goes well, then we will be in a position to establish a year round station. Back in China, I understand that you are also developing an education and outreach programme? Yes. For this we have allocated about 10 million Yuan and hope to reach out to the general public through lectures, exhibitions, etc. We are even considering the possibility of asking the public to vote online to choose the name for our Dome A station. We are currently carrying out an education and outreach programme for Chinese undergraduate students in the Arctic, and are also thinking about establishing an artist and writers programme. We have some very talented artists and writers here in China, so I hope that we can extend our range of activities to the humanities in this way. Huigen Yang is the Director of the Polar Research Institute of China (PRIC). Prior to his current position, Dr. Yang was Deputy Head of the PRIC.